FDOT could soon add bike lanes along the most dangerous road in Pinellas County. 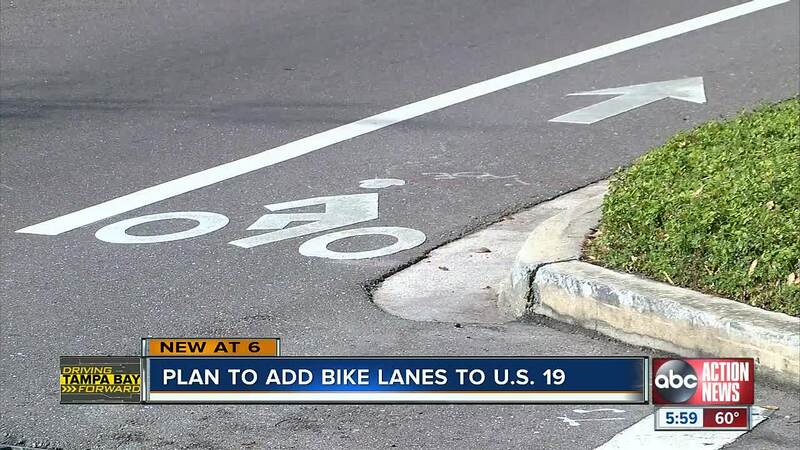 As part of a new redesign along U-S 19, transportation leaders are looking at adding bike lanes along US-19 from 66th Ave N to 118th Ave N.
PINELLAS COUNTY, Fla. — FDOT could soon add bike lanes along the most dangerous road in Pinellas County. As part of a new redesign along U-S 19, transportation leaders are looking at adding bike lanes along US-19 from 66th Ave N to 118th Ave N. The nearly 4-lane stretch could see 7 feet wide bike lanes with 2 additional feet of buffer space between cars and cyclists. It's an idea that has some cyclists worried sick who feel the road is already dangerous and that adding bikes to the mix could make it more deadly. Cyclist Irv Bernheim already tries to avoid riding his bike along the roadways. "I feel like drivers try to play chicken with me. I’ve been almost run over so many times I can’t count,” he said while biking Monday. Bernheim says 99% of the time he uses the Pinellas Trail instead. "I feel much safer here," he said with a chuckle. Transportation advocacy group Forward Pinellas says the new bike lanes could actually increase safety. “In fact statewide there are far more crashes involving bicyclists on sidewalks versus in a bike lane or on a travel lane with no bike lane,” Whit Blanton, the organization's director, explained. According to Forward Pinellas, bikers are 20 times more likely to get hit on a sidewalk than in a bike lane. "Drivers are pulling out of businesses and they are less apt to see bikers who are riding on sidewalks," Blanton added. “Maybe if it’s separated from the roadway it would be ok but there’s gotta be a decent amount of separation between the bikers and the cars,” he elaborated. FDOT is still in the design phase and any construction on the bike lanes could still be a couple years away.